Multivariate analysis of variance was used to determine if there were differences in seven measures of motivation between students enrolled in 12 e-learning and 12 traditional classroom university courses (N = 353). Study results provide evidence that e-learning students possess stronger intrinsic motivation than oncampus students who attend face-to-face classes on three intrinsic motivation measures: (a) to know, (b) to accomplish things, and (c) to experience stimulation. There were no differences in either three extrinsic motivation measures or amotivation. Additionally, graduate students reported stronger intrinsic motivation than undergraduate students in both e-learning and traditional courses. However, there was no evidence of motivational differences based on ethnicity. Recommendations for further research are provided. Rovai, A., Ponton, M., Wighting, M. & Baker, J. (2007). A Comparative Analysis of Student Motivation in Traditional Classroom and E-Learning Courses. 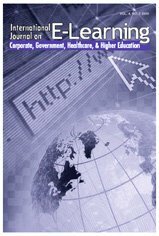 International Journal on E-Learning, 6 (3), 413-432. Waynesville, NC USA: Association for the Advancement of Computing in Education (AACE). Retrieved April 25, 2019 from https://www.learntechlib.org/primary/p/20022/.